Please leave any feedback for the Rituals of Revenge, Nightsister Advanced Tactics, and Defense of Dathomir events in this thread. Thanks! Designer of all things Events for SW:GoH. I don't reply to attacks or negativity. Keep it civil. 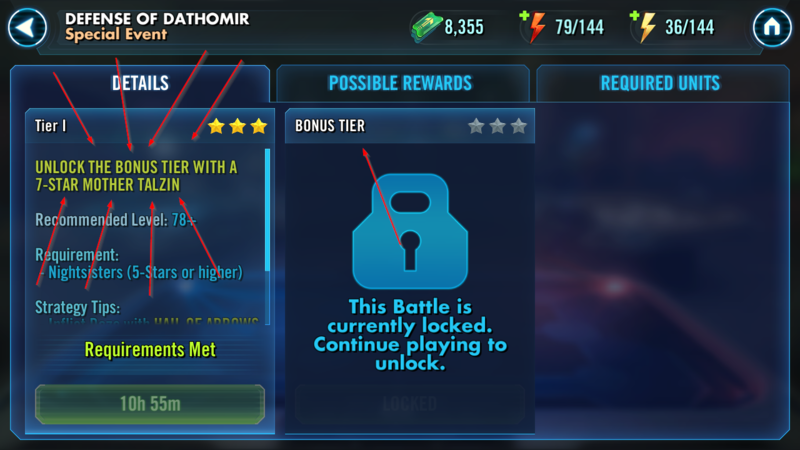 What is the requirement and reward for Defense of Dathomir Bonus Tier? The bonus tier for defense of dathomir won't even unlock or tell me the requirements. it says to continue to play to unlock. I beat the basic tier. Have to have Talzin at 7* to unlock the bonus tier. Wouldn't it show requirements? all I can see is the line to continue to play to unlock. there's nothing to play. unless they mean continue to pay to unlock... I'm just not able to see requirements. Wish I could screen grab and post here, but on computer. What gear level do NS need to be to beat Tier 1? The sleazy bait and switch ripoff from the ewok event yesterday killed 99% of my interest in this so I'm not even playing it until the last possible moment so that other players can find the bugs. Mine are gear level 7 or 8 and all lvl 72. It wasn't a challenge but it wasn't all one hit K.O.s either. All were ability lvled as high as possible. no omegas. They addressed the requirements in the update notes. And yes....if you want to unlock tier 2 now, you'll have to pay. I didn't read update notes, just going off of what i'm seeing in game. And the bonus tier is locked. But 7* requirement is just dumb. Ain't nobody got time for that! Is Defense of Dathomir the only way like Wicket that you can obtain Mother Talzin shards? Am I right in concluding that this is a paying player only event? Only 4 of the nightsisters are on farmable nodes. The rest can only be bought to get to 5 stars, right? No, they are all farmable except for the new ones. Daka from cantina store, Ventress from arena store, Talia from hard nodes and cantina, acolyte from cantina, and initiate from galactic war store. Not saying this is the only way to do it or best idea or whatever. Just saying what worked for me. All had abilities maxed to their lvl except daka. didn't put any omegas on her and her leader was at lvl 1. Used Asajj as leader. Talia leader was lvl 1 as well. I'll fully admit the event only abilities were really nice. The rain of arrows doing daze was a true lifesaver. Daka rezed so many of her allies. None from her passive though. Can't say I didn't have some help from RNG but it really wasn't too bad other than daka getting 10,000 rez lol. In short: Daka stun and rez are incredibly useful/important. Save asajj ability Strike Fear to dispell the protection buffs. Use rain of arrows (event ability) to get daze. I’m also unable to play the bonus tier of in the Defense of Dathomir event. When/how does this unlock? I was pleasantly surprised to have beaten the Defense of Dathomir event so easily, which makes me feel like Mother Talzin is farmable for me if I put the time in. I had a lot of fun with the event as well, especially with the special abilities! I am also very happy I had the opportunity to unlock Mother Talzin and use her as F2P via marquee! Hey OP, I thought the events were a lot of fun. The rain of arrows was a big help to deal with the B2s and Dooku. I had no problems playing the events. I have always wanted to build my Nightsister team, and lucky for me these events lined up perfectly with my farming priority, having just finished 7* Captain Han and Chirpa (finally), and Phoenix and Finn before that. Now I have the incentive to finish them up! And just in time for Halloween too, that's a nice touch. Now, if you don't mind, please make Director Krennic shards available on Cantina Battle 3F and put Shoretrooper in the Cantina Battles Store. Thanks! In Tier 2, unlocked only when you have a 7-Star Mother Talzin yourself, battle a vastly more powerful incarnation of the Separatist forces with any 7-Star units you own! Succeed and earn 2-4 coveted Zeta Ability Materials! Tier 2 is available to win once, with no crystal refresh, each day the event runs. They added some nice information on the Tier 1 since the bonus tier stays locked till you meet the requirements. No need to even read update notes. Just played the special event and thought it was a cool way to get comfortable with the team and kill characters that still had protection. While it was fun, I'm going to have to harp on the one way communication lately. Nobody could clarify a simple question about the refreshes, which would've saved me a couple thousand crystals if I knew we could play both tiers on this one instead of choosing which to play like Wicket. The marquee event was the best, loved being able to fight different factions. I enjoyed the flash event T1 that supplied all of the NS as event units to get a feel for them. I'm guessing that tier will stay that way so people can keep trying them out whenever the event rolls around. I thought it was cool that you gave different event abilities to healers and attackers and the abilities felt appropriately powerful. I'm guessing they scaled in power with the toon using them. One addition I'd like to see is a tough battle per faction to work towards that came with these flash events/marquee/assault battles, similar to the ewok AT-ST event. I'd feel like I have something to look forward to when it came around again, something more than auto loot. Kind of like a mastery of the faction test. Great job with these events, I feel like the experience has been more rewarding and less tedious. Edit: I'm happy about the refresh on the defense event. Finishing top 3 in arena is enough to save crystals and earn more shards of the new toons I'm interested in so I feel better about the struggle. THe new "flash" event style was excellent. One tier with the "max" team provided and then the same team with your own characters. Fantastically done. The difficulty level was excellent. I have g11 Daka, g10 Ventress and g9 Talia & Initiate (all 7*) and a 5* Acolyte (but g8) and they barely were able to complete it (honestly, I got some lucky stuns to double stick with Daka). It was a great challenge and the rewards for tier 2 were excellent. Please have more events like this. That was great. I also really liked the other events as well. The Defense of Dathomir was great fun as well. Very well tuned for the challenge. I did complete it, but needed to be vary strategic in the use of the event abilities and Daka's rez. Good fun. The Talzin marquee event was also a blast. I ran my NS with her, just so I could see the synergies. Good stuff. Overall, this was some of the best set of events yet. While I don't love the release cadence (honestly, some of these characters could/should end up on hard nodes), I do enjoy the new style of events immensely. Overall, very well done.